Atrial flutter is a common condition, especially in older patients. 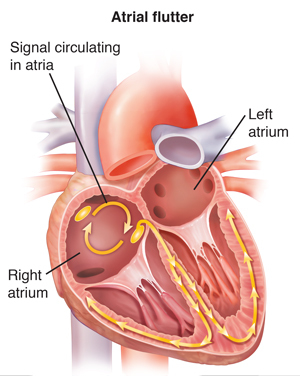 It is most often caused by a rapid electrical circuit that revolves in a circular fashion (like cars on a roundabout) in the right atrium (upper chamber of the heart). It is a common problem encountered by an electrophysiologist as they are the experts in treatment of heart rhythm conditions. The lower chambers (the ventricles) usually follow at rate of 100 to150 beats per minute. Patients typically experience breathlessness, palpitations and fatigue. Atrial flutter tends to be persistent and is often impossible to treat satisfactorily with drugs. Flutter can coexist with atrial fibrillation (AF). Many cases of atrial flutter be cured with catheter ablation (success rates of over 90%). Ablation involves the use of heating energy to interrupt the electrical circuit (create a road block) via a wire passed through the vein at the top of the leg. In many cases the procedure can be performed without the need for a general anaesthetic. Patients are on their feet following the procedure after a few hours and are discharged home the following day. Are you considering an atrial flutter ablation? If you would like a consultation with Dr Gomes please refer to our Contact page for available locations close to you, and phone or email for your appointment.